1. Another athlete with character refuses to participate in Iranian oppression against woman, withdraws from international shooting competition. Former World Number 1 Heena Sidhu has pulled out of the Asian Airgun Shooting Championship which is to be hosted in Tehran, Iran this forthcoming December. Her refusal to participate in the event comes in light of the fact that all the women participants have to wear a hijab, the official dress code in the Islamic Republic of Iran. “It is not a sporting thing, forcing tourists or foreign guests to do this (wear a hijab). I don’t like it, so I pulled out,” Heena was quoted as saying to the Times of India. This makes the second person of integrity which has made the media recently. An American chess champion has also refused to play in an international tournament in Iran for the exact same reason and it may have cost her fame and success to do so. The very definition of character ad integrity. After all, if principles where cheap everyone would have them. 2. A candidate for the French National Front party speaks in a town in France, after having to get special permission from the mayor to put forth a point of view that is not the typical Marxist one. 3. Bulgaria: Scores protest more planned migrant housing. The Rebel posted on Bulgarian migrant riots, protests and local's attitudes yesterday. Bulgaria borders Turkey, and they have militias of private citizens now trying to enforce the law because the governments can not or will not. 4. Hillary Clinton's most trusted confidant and associate for her whole term as Secretary of State was a woman named Huma Abedin. She is also the wife of the man at the center of what is being called, "Dickileaks", Anthony Wiener. But who is Huma? 5. 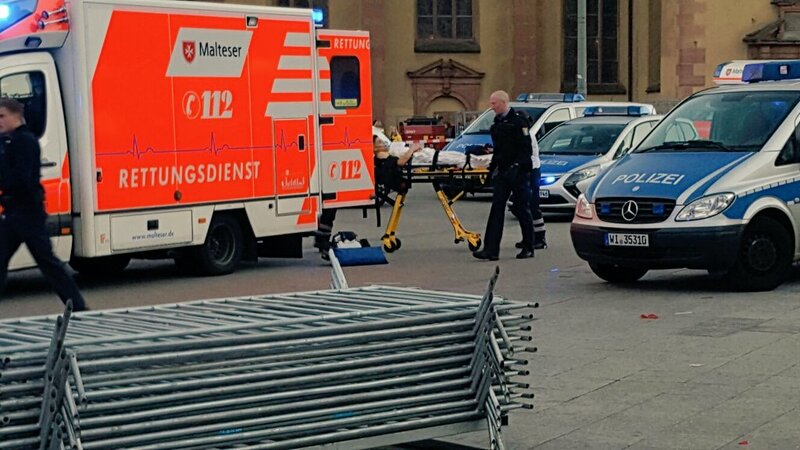 BREAKING: A stabbing attack at a mall in Frankfurt Germany. Four people have been injured in a stabbing attack in downtown Frankfurt, Germany, a police spokesman told local FFH radio. The perpetrator is on the run, police added. According to FFH the motive for the attack is so far unclear. It is also unknown how serious the injuries of the four victims are. This is a breaking story. As information becomes available it will be updated. God speed Marine Le Pen! Good for Heena Sidhu, for refusing to wear the hijab in Iran. Crazy Islamics forcing visitors to submit. I feel for the Iranian people who were yanked back into the dark ages in the late seventies. They had some freedom, and now they are once again enslaved by Islam. Huma Abedin is going down, and I expect Hillary will have an even harder time hanging on, but I have to give Hillary credit, she never gives up. She will cling until her last finger is peeled away from her grip. I can earn $87 a week by going on forums and annoying people more than Person or Kelly or Stephenson. Yeah. I’ll get right on it.